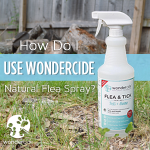 Flea & Tick Control for Pets + Home is Wondercide’s natural flea and tick control for pets. This spray kills and repels fleas and ticks. It also eliminates insects in the egg and larvae life stages. Our spray is safe to use around your home, children, and pets. However, cats are naturally more sensitive animals. So, like many responsible cat parents, you may have questions about using Pets + Home on cats. Is it Safe to Use Pets + Home on Cats? The short answer is YES. Wondercide products don’t contain any conventional pesticides or oils that are toxic to cats. Phenols, or phenolic compounds, occur naturally in many essential oils. Even though essential oils are beneficial for humans, dogs, and horses, they can be overpowering to cats. Cats have a different physiology than many other animals—they don’t have the liver enzyme needed to break down the phenolic compounds in certain essential oils. Oils like clove, eugenol, cinnamon, and thymol have a lot of phenolic compounds, and high doses of these oils are known to be toxic to cats. Cedarwood is an essential oil that is rumored to be toxic to cats, which is not entirely true. There are many species of cedar trees, just like there are many types of oak and apple trees. Not all cedar species are created equal. Some types of cedar are safe, and others can be toxic to animals and people. Wondercide only sources cedarwood oil from safe cedar species. Wondercide products made with cedarwood oil are intentionally phenol-free. Independent lab tests verify our products don’t contain any phenolic compounds. Pets + Home is safe for cats, and many people with kittens, nursing mothers, and adult or aging cats successfully use it on their cats and in their homes. However, we recommend testing the spray in a small area on your cat and monitoring for signs of sensitivity after using Pets + Home for the first time. How do I use Pets + Home on cats? Sensitivities don’t occur often, but we love your furry companions, too, and want to err on the side of caution. Test a small area on your cat in order to find out if your cat is sensitive to the product. We even offer a tester size if you want to test your cat for sensitivities before buying a larger bottle. Keep in mind that small tester sizes are not meant to treat an entire animal or room. To test, we recommend applying a quarter-sized amount (1 pump of the spray bottle) to the back of their neck. Wait 1-2 hours to see if any signs of sensitivity develop. What are the signs of cat sensitivity? Click here to find out. If your cat does not show signs of sensitivity, proceed with applying to the entire animal. As recommended on the product’s label, mist your cat lightly with the spray and rub the fur in the opposite direction to make sure the product reaches the cat’s skin. If your cat has long fur, you may need to gently massage the product into the fur. Never soak your cat with Pets + Home or any other product. How do you get rid of the phenols and still claim that the product repels fleas and other insects? Wht extrction processes are used and where does the original cedar oil come from? Great questions Deanna! Our proprietary process ensures that no phenols exist in our raw cedar oil or finished products. Contrary to your statement, Phenols are not what make the product “repel” pests. Other compounds within the oil at certain percentages are what provides efficacy, both killing on contact and repelling. The cedar oil Wondercide uses comes from the Southern USA region and is steam distilled. No chemicals are ever used in the process. Wondercide cedar oil is batch tested to ensure no phenols are present and the active compounds are within the optimal ratios for performance. We hope this helps! It is necessary to coat the whole body of a cat or can it be applied primarily along the spine from the base of the neck to the tail, similar to the spot or stripe application? Thanks so much for your question! We know how important it is to make sure your feline friends are safe and pest free and EVOLV is a great product for this! EVOLV is most effective when applied over the entire animal and massaged into the coat to reach as close to the skin/hide as possible. Some folks prefer to spray their hands and/or a towel and gently rub the EVOLV on the cat for application. EVOLV is a “use as needed” product and can be applied as often as daily or as little as once or twice a week depending on the circumstances. We hope this helps, but let us know if you have any other questions! Wondercide products are made from human food grade ingredients have no known toxic effects from licking the product. Because our products are oil based, your feline friend may experience increased salivation or loose stools if a large amount is ingested through grooming. Typically when we receive this feedback, it indicates that too much of the product is being used. A light misting is all that is needed to be effective. If your cat is a heavy licker, you may consider treating the yard and home to eliminate the source of the infestation. Hope this helps! I’ve spent alot of money for flea control-The Revolution that I bought for the last 3-4 yrs did not work this year. The fleas have became imune to it. I tried this Evolve last week and am absolutely amazed how good it works. I couldn’t beleive the fleas died in a matter of seconds. Needles to say I imediately bought more. Also I have a friend that is into natural flea remedies, I told her about it and she was excited to try it too. Love this product!!! works better than anything I’ve tried, no chemicals to make the cats get sick which is a big plus. I was anxiously awaiting the arrival of my Wondercide, and was was very happy when I saw the UPS guy today! I immediately vacuumed my house and applied the indoor solution. Then I sprayed my dogs. The fleas were dead immediately and I mean immediately!!!! I am in love with WONDERCIDE! Thank you so much for a product that works and smells great! (I ordered cedar) My dogs thank you too, I have 5 pugs and we were starting to have a flea problem, I know this has nipped it in the bud!! Going to go spray my yard, thanks again!!! What a life saver for my dog & my sleepless nights. Scratching, licking, biting to the point where I was constantly treating the red spots, washing, vacuuming, laundry, diatomaceous earth, harsh furniture sprays…nothing was working completely just keeping my house under control. I wasn’t infested with fleas but believe my dog has a allergy as I also had a electric flea catcher and would catch one, see two on my dog. I ordered Wondercide as it was recommended in the Dogs Naturally Magazine I read. My dog now sleeps the night without any flea disturbances, she is happy with very little scratching. As soon as she scratches I spray a bit of Wondercide Evolv in my hands & rub her down….magic! Will order again next year Spring/Fall + for my yard. Thank you Wondercide you are our lifesaver! Thank you for trying to find safe alternatives to conventional pesticide products. Without reference to government agencies and other organization’s categorization of cedar oil products since I do not have much respect for their assessments, and I understand that you have removed the phenols, but what about the other ingredients…what toxicology has been performed on your products? Thanks for your interest in Wondercide! We appreciate pet parents who take the time to research new products they plan to introduce to their furry friends, so thanks so much for your question! We’re happy to help. I know you mentioned you were not interested in references to government agencies; however, because the ingredients in Wondercide products are Generally Recognized as Safe (GRAS) by the FDA and fall under FIFRA 25(b) Exemption, we are not required to perform toxicology testing. Additionally, our products are cruelty-free and not tested on animals. That being said, we use only highest grade ingredients that are sourced in the USA and we receive batch analysis on all raw ingredients prior to use in our products so we can ensure their quality. Wondercide products have been used by thousands of pet parents across the globe for many years with great success, as evidenced by our product reviews and customer satisfaction ratings. We do have 1-ounce sample sizes of our best-selling products available for purchase if you’d prefer to try the product before committing to a larger bottle. Can Wondercide be used around rabbits? We have a pet rabbit that we let out into the yard. Happy Wednesday! I hope you’ve had a great week so far. Thanks so much for your question! While it is safe for your pet rabbit to be in a treated yard, we do not recommend spraying rabbits directly as their respiratory systems are very sensitive. I hope this helps, but please let me know if you have any other questions! Hi, I just got my Wondercide a week ago tomorrow. I loved it from the start, but my long hair cat, (after 8 hours went by, flea free, from the first application), started scratching again, and it disappointed me. I’ve been trying to do better, but it’s hard to get the whole body under all that hair. Sometimes she likes to go outside, and I even treated my yard with the old dawn/water mix to keep fleas down out there. But is it normal to have to spray her every day? I think I may use up the tiny repellant spray in a couple weeks? How long does it usually last? I also got the home spray and it seems a little oilier, would it be better to use that on her instead of the tiny repellant spray? I’ve also tried spraying her brush and hoping the tines will take the spray down to her skin when I brush her, but I guess I need a few more pointers, or any other good ideas/options. Any clues for long hair cats? We are glad to hear that you are loving the products you ordered. It is safe to apply it to your cat on a daily basis. 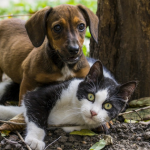 Everyone is different, so it really depends on your pet and the pest activity in your area. For most, it is every 2-3 days, but is a use-as-needed product. A good way to not have to treat your cat daily is by treating the yard. I am not sure how effective/long-lasting the dawn/water mix would last on your yard. We do make a great Flea & Tick Yard + Garden that will take care of a majority of your pest problems outdoors. If you are seeing a reoccurring problem, then it could indicate that the problem is coming from the yard. Once that is treated, you won’t have treat your cat as often. You would also want to use the inside spray to spray bedding, carpeting, and furniture. The 32 oz of the Indoor Pest Control will cover about 400 sq ft. You can use that same product to refill your smaller bottles and use it on your cat. The Insect Repellent would probably last 1 cat for about a month if applied every 2-3 days. The Indoor Pest Control shouldn’t be more oily, as it is the same formulation as the Insect Repellent. The best way to apply it to cats is by using your hands. THIS is a great video to show how to apply it. It shows a small dog, but the idea is still the same. You want to make sure that you are applying it all over the body. We do recommend getting as close to the skin as possible because this is typically where the eggs are laid. Sometimes, especially with long-haired kitties, it is difficult to get to the skin. In these cases, just thoroughly applying the spray with your hands on a regular basis should work just as well. I hope this helps! 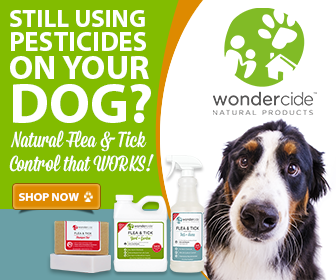 I have a question I bought Wondercide for my dog and it works great on him, the only problem is that the fleas are now on the rabbits. i have 2 house rabbits (free range) and 1 foster rabbit and now all 3 have fleas. While I am not going to use the spray directly on them, is it safe to spray the carpet. Will it harm them when they are hopping and laying on the carpet and then go to groom themselves? We are excited to hear that your pup was able to get rid of those fleas! I am sorry to hear that they have now migrated to the bunnies. It is perfectly safe to use the spray inside their environment. All of the ingredients are non-toxic so it is fine if they ingest some. It is also safe for them to be in the areas treated. If you were going to treat wall-to-wall, then I would recommend removing them from the area that you are treating for 30 minutes- one hour. The only reason is because the smell might be overwhelming for them in such large quantity. Otherwise, there is no waiting period. I hope this helps! Please feel free to reach out with any other questions that you might have. Thank you again for reaching out to us. Let us know if you have any questions! Hi can I use it on children’s clothing? Yes! The Flea & Tick for Pets+Home spray is safe for both pets and people, and can be used by your children both on themselves and their clothing. Hi there. I recently used the outdoor treatment on my yard. But I found a tick in my Aussie today. I’m excited by the use of such a wholesome product. But how soon does it repel ticks? How long can I expect it to work? How often should I spray the yard? I’m still a bit worried about applying it to my cats. Can you put my mind completely at ease? Thank you for your product.